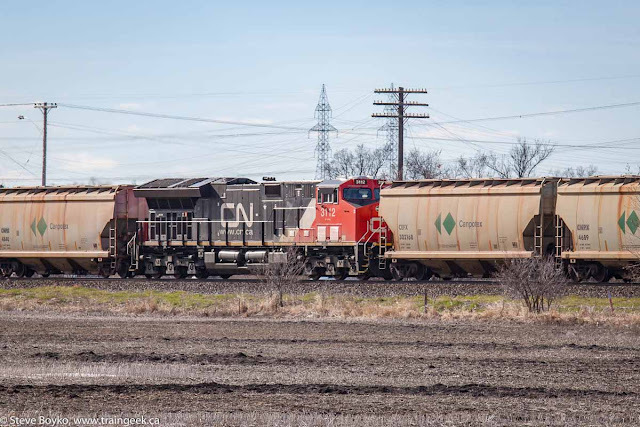 On April 25th, I spent some time trackside around Winnipeg and saw a total of six trains. 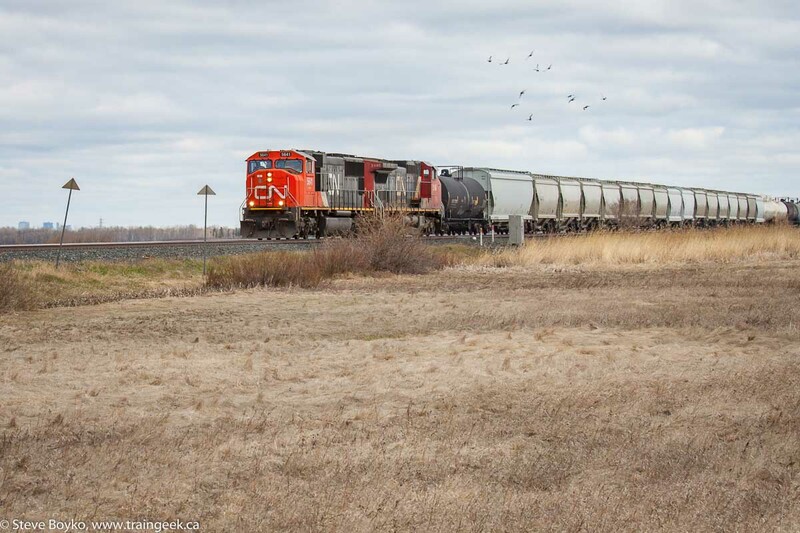 I decided to head up to the CN Rivers subdivision to try to catch the Winnipeg-Churchill train departing. This is VIA 693, formerly known as the "Hudson Bay". At times it has had a Park car on the rear but I think they haven't had one for a while. I got to the track and headed east along Wilkes Avenue. 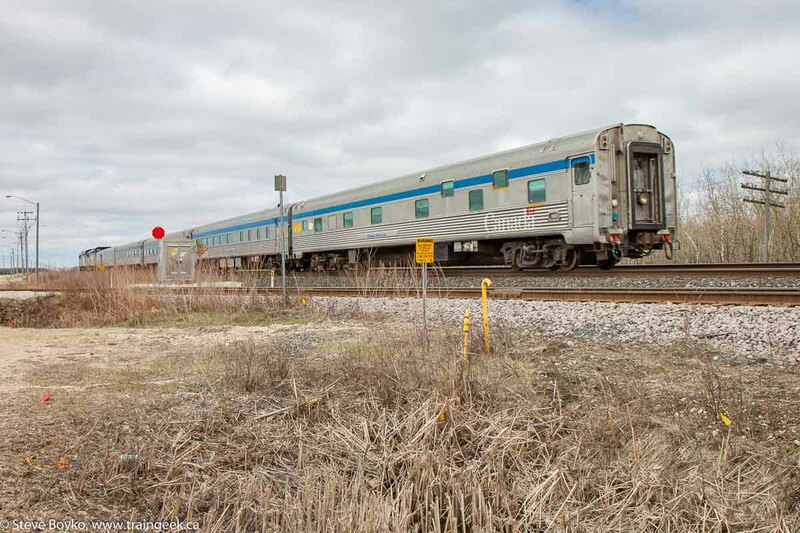 As I passed Carman Junction I saw headlights to the east, which I assumed was VIA. I noticed a CN crew working on the signals at the junction so I parked just west of them on the shoulder. Sure enough, it was VIA 693 approaching at a slow speed. 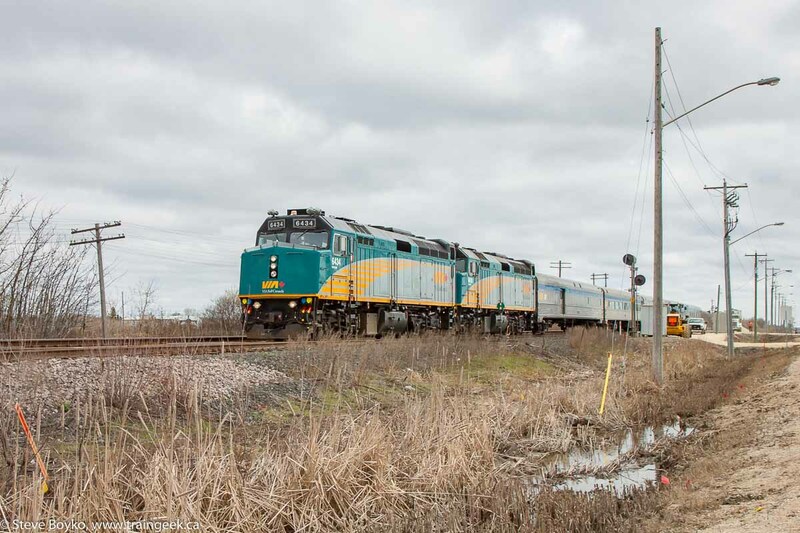 The train had VIA 6434 / 6418 for power with baggage car VIA 8606, coaches VIA 8113 and 8122, diner ANNAPOLIS (VIA 8404) and sleeper CHATEAU MONTCALM (VIA 8219). Incidentally, I saw almost exactly the same trainset on April 11th, except on the 11th it had a second baggage car, VIA 8600, for some reason. After that, I headed to just east of Diamond and parked. I got my laptop out and banged away on the keyboard, while glancing up occasionally to look for trains. After about half an hour, I spotted a train in the distance, rounding the corner at mile 16. As they passed Diamond, I got out the "big gun" (my 70-200mm lens) and took some shots of the approaching train. 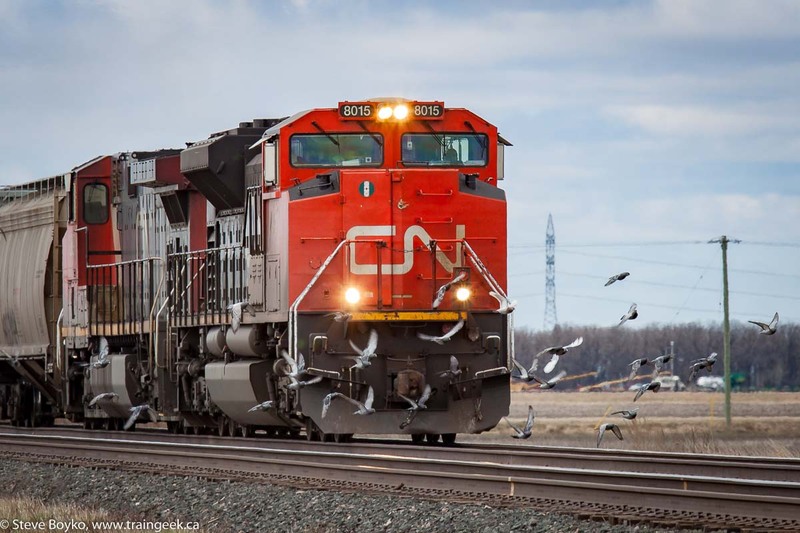 The approaching train disturbed a group of birds, who briefly swarmed in front of the train. I dropped my camera and took video with my iPhone, so I didn't take any more stills of the train. It was a general freight with a lot of covered hoppers on the head end, a mid train DPU (CN 2308), and mixed freight on the rear. The video is at the end of this post. About half an hour later, the next train came rolling along. 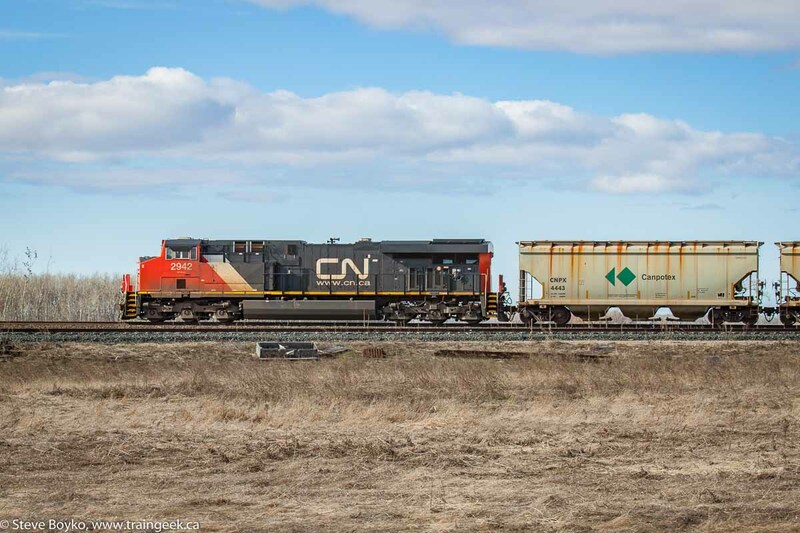 It was another general freight, with CN 5641 and CN 2145 for power. There was nothing particularly interesting on the train... the usual graffiti that I won't share. As I rounded the Perimeter Highway, I thought I spotted a headlight on the CP La Riviere subdivision to the south. I exited and drove toward it a bit, and sure enough, it was a train. CP 2240 and 3016 were heading north / railway east, coming back from working the entire subdivision. 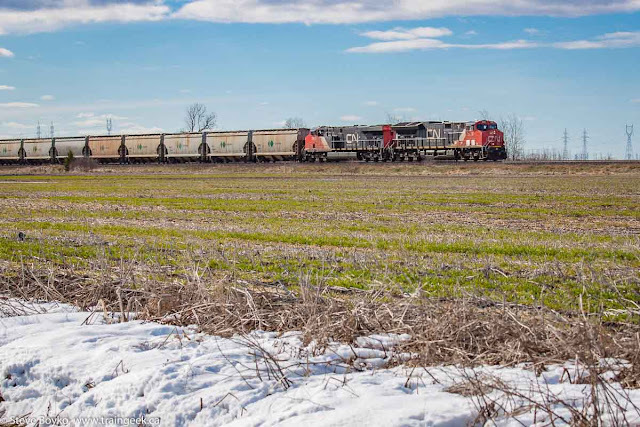 They had a set of CP flatcars on the tail end, empty after depositing their loads of pipe near Morden. Enbridge is replacing the majority of its existing Line 3 pipeline, which runs from Hardisty, AB to Superior, WI. 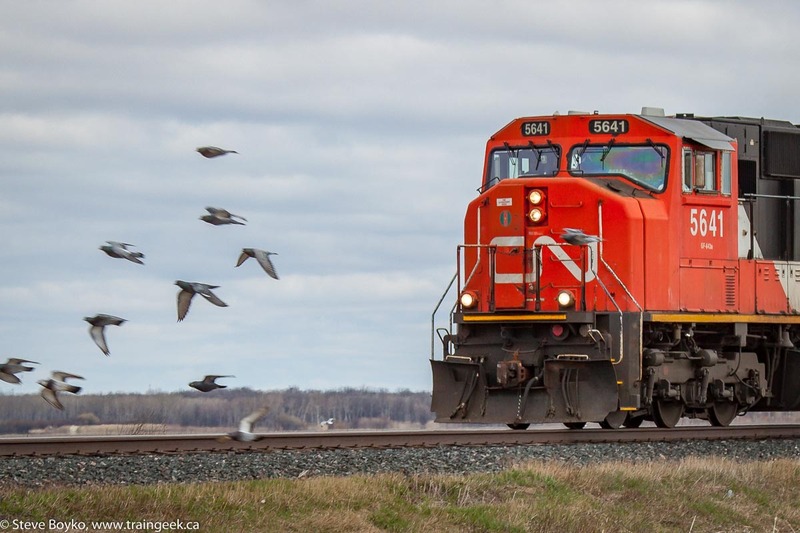 In Manitoba it runs through Cromer, Morden and Gretna. 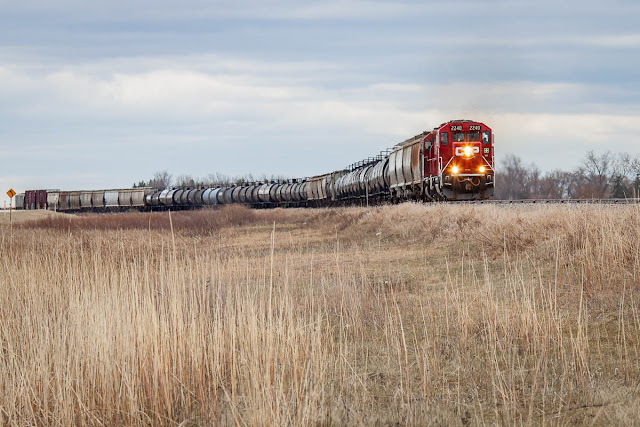 The line was originally built in the 1960s and was running at reduced pressure after a rupture and spill near Pilot Butte outside Regina in 1999. The new pipeline is being build adjacent to the existing line and the existing segments will be taken out of service. Again I recorded video with my iPhone. I managed to get some of that sticky Manitoba mud on my shoes. That stuff is a mix of mud and clay and is really hard to get off. Often you end up with an inch or two of it layered to the bottom of your shoes. I took my son to his choir practice in the late afternoon, then headed out toward Transcona. I saw a train leaving Symington Yard through Beach Junction, heading east, so I carried on out toward Dugald to get ahead of them. I knew they would have to slow down through the yard so I was confident I could beat them. In fact I got to a rural crossing on the way to Dugald and had enough time to set up my Canon S3 as a video camera. I then shot the approaching train with my camera, then dropped that and took video with my iPhone and with the S3 as well. This was my first time recording video with two devices at once, and I've spliced them together in the video at the end of the post. Here's CN 8949 approaching with 8925 assisting. It's starting to get green here in Manitoba! After that train passed, I collected my video camera and headed to Dugald. I sat there for a bit near the elevator until it was time to head back into Winnipeg to pick my son up. However, CN wasn't done with me yet. I saw another eastbound train so I pulled off to the shoulder to photograph it. 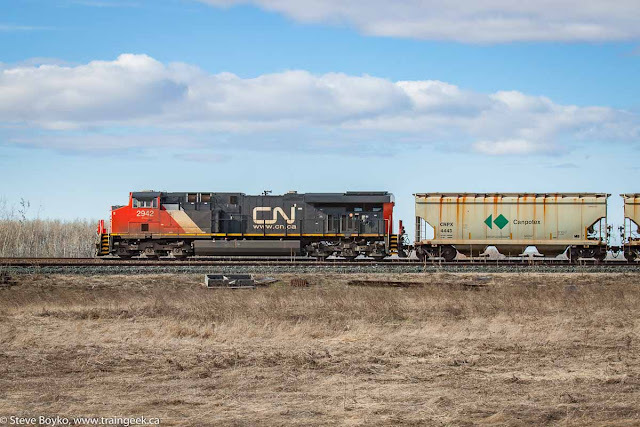 The long string of Canpotex cars with the 2+1+1 DPU arrangement made it pretty obvious it was CN 730, destined for Saint John, New Brunswick and the potash dock there. 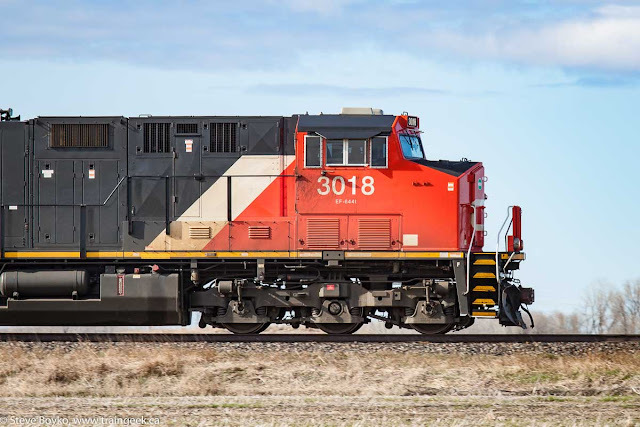 CN 3018 and CN 2959 were the head end power. I drove on for a bit and found the mid-train DPU... CN 3112. Bringing up the rear was CN 2942. This train had some newer power! No video for this one! The same train was through Drummondville, Quebec at 09:09 Eastern on Friday, and out of Joffre, Quebec at 17:30. It arrived in Saint John, NB Saturday morning around 10:30 AM. So I've been talking up this video all through the post. Here it is, with CN 8015 East, CP 2240 East and CN 8949 East. 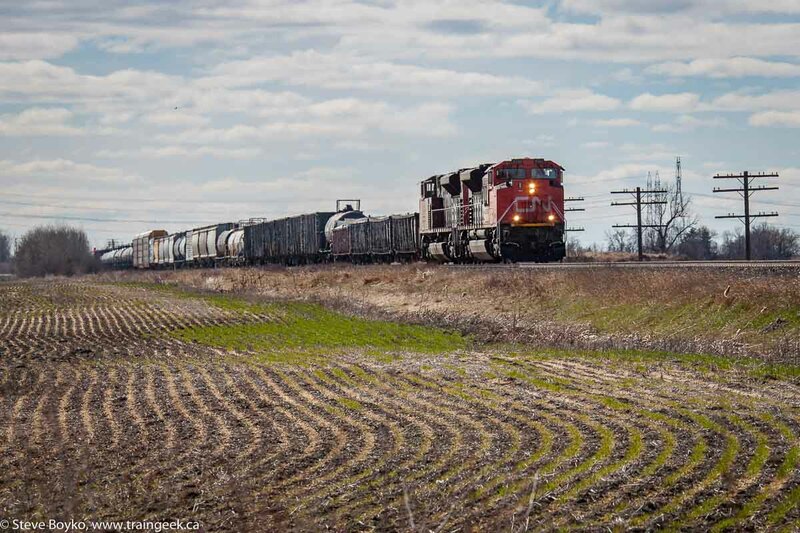 I did some editing to cut out a lot of the "watching train cars go by" monotony. I understand some people like to see the whole train, but I don't.. and the CP one in particular was going so slowly that it would really draaaaag the video out. I hope you like the editing - please let me know what you think! A good day! Someday I'd like to take a passenger train across the country. 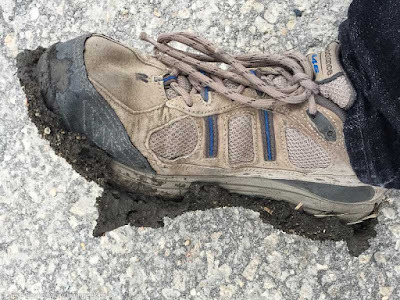 Ha, wait till you get Alberta mud stuck to your shoes! This stuff is heavy as cement and will not let go! It's quite a workout. Walking though the stuff will find you several inches taller at the end. Awesome post, always enjoy stopping by here over lunch. Hey Steve, just thought I would share that I really liked how you edited the video just like you I would rather just see the beginning and maybe the end considering that usually the cars are just bland and they can take forever to pass. Thanks for the feedback, Dash 8! I'm glad we are on the same wavelength. When I win the lottery then! Lol any day now! I noticed last weekend that they've been replacing the signal control boxes ("bungalows" I've heard them called) along that stretch of the CN main. Makes me wonder if the searchlight signals aren't long for this world. Hi Rick, yes, a lot of LED signals are popping up, so the searchlights are on their way out. See them while you can!